Today, a billion-dollar-a-year polling industry floods the media with information. Pollsters tell us not only which political candidates will win, but how we are practicing our faith. How many Americans went to church last week? Have they been born again? Is Jesus as popular as Harry Potter? Polls tell us that 40 percent of Americans attend religious services each week. They show that African Americans are no more religious than white Americans, and that Jews are abandoning their religion in record numbers. According to leading sociologist Robert Wuthnow, none of that is correct. Pollsters say that attendance at religious services has been constant for decades. But during that time response rates in polls have plummeted, robotic "push poll" calls have proliferated, and sampling has become more difficult. The accuracy of political polling can be known because elections actually happen. But there are no election results to show if the proportion of people who say they pray every day or attend services every week is correct. 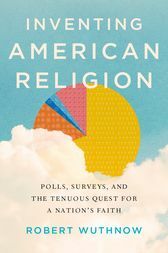 A large majority of the public doubts that polls can be trusted, and yet night after night on TV, polls experts sum up the nation's habits to an eager audience of millions.Inventing American Religion offers a provocative new argument about the influence of polls in contemporary American society. Wuthnow contends that polls and surveys have shaped-and distorted-how religion is understood and portrayed in the media and also by religious leaders, practitioners, and scholars. He calls for a robust public discussion about American religion that extends well beyond the information provided by polls and surveys, and suggests practical steps to facilitate such a discussion, including changes in how the results of polls and surveys are presented.